Our well designed pedagogy enables you to effectively maximize the learning from the program. b. Text / Visual elements. c. Quizzes / Other interactivities. Each concept session is customized to the learning level and style of the student. The pace is absolutely one's own. 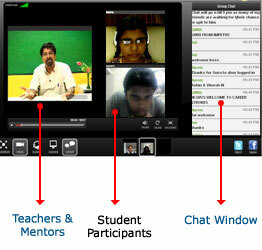 Live interaction with teachers and coaches through video/audio and text chat. You can even phone in with your doubts during the interactive Question & Answer Sessions. The Pedagogy and Instructional design are based on aspects of Bloom's Taxonomy and Gagne's nine-step methodology in terms of building content and ensuring the right mode of delivery. In our pedagogy, we have tried to use some or more of these elements in every learning object. Sometimes you might see application first, and then the knowledge/concept behind it, as we try to relate to the learner. E.g they might know a cricket shot being hit (which is an application) and then move on to knowledge and analysis (concept behind the phenomenon). This, in some cases proves to be unconventional but more effective. 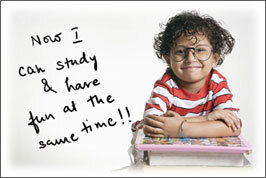 Our endeavour is to make learning holistic yet something that the student can relate to. Bloom theorized that learning is a process beginning with knowledge of the subject, comprehension of the materials, application of the material, analysis of what is being taught, synthesis to make new ideas, and finally, evaluation of the content being learned. Knowledge The recall of facts, figures, and concepts. Comprehension The grasping of meaning of what is being taught. Application The solution of problems using skills being taught. Analysis The examination and discussion of ideas. Synthesis The connections of parts of ideas to form a whole new idea. Evaluation The judging and weighing of ideas and concepts. Knowledge Student recalls or recognizes information in the approximate form it which it was presented. Students write, list, label, list, name, and define. defines, describes, identifies, knows, labels, lists, matches, names, outlines, recalls, recognizes, reproduces, selects, states. Comprehension Student comprehends or interprets information based upon prior learning. Students explain, summarize, paraphrase, describe, or illustrate. comprehends, converts, defends, distinguishes, estimates, explains, extends, generalizes, gives Examples, infers, interprets, paraphrases, predicts, rewrites, summarizes, translates. Application Student selects and uses information to complete a problem or task without excessive direction. Students use, demonstrate, apply, construct, solve, or compute. applies, changes, computes, constructs, demonstrates, discovers, manipulates, modifies, operates, predicts, prepares, produces, relates, shows, solves, uses. Analysis Student classifies and relates the assumptions, evidence, or structure of a statement or question. Students analyze, categorize, compare, or contrast. analyzes, breaks down, compares, contrasts, diagrams, deconstructs, differentiates, discriminates, distinguishes, identifies, illustrates, infers, outlines, relates, selects, separates. Synthesis Student collects, integrates, and combines ideas into a new product. Students create, design, hypothesize, invent, or develop. categorizes, combines, compiles, composes, creates, devises, designs, explains, generates, modifies, organizes, plans, rearranges, reconstructs, relates, reorganizes, revises, rewrites, summarizes, tells, writes. Evaluation Student assesses, appraises, and critiques ideas, using standards and criteria. Students judge, recommend, critique, or justify. appraises, compares, concludes, contrasts, criticizes, critiques, defends, describes, discriminates, evaluates, explains, interprets, justifies, relates, summarizes, supports. Gagne's book, The Conditions of Learning, first published in 1965, identified the mental conditions for learning. These were based on the information processing model of the mental events that occur when adults are presented with various stimuli. Gagne created a nine-step process called the events of instruction, which correlate to and address the conditions of learning. The figure below shows these instructional events in the left column and the associated mental processes in the right column. 9 Enhance retention and transfer to the job Retrieval and generalization of learned skill to new situation. In every module of ours, we have tried to incorporate some or more of these elements so that completes the internalization of the topic. Of course, we have not been too strict to adhere to the process to factor in continuity and making the sessions a little more sports oriented.